RT Book Reviews 4.5 star TOP PICK! "...a marvelously funny, engaging, and memorable romance in a place where everyone knows your name." "Laura Trentham writes an intricately woven story that throbs with rich emotion. I laughed, I cried, I lovedSlow and Steady Rush!" 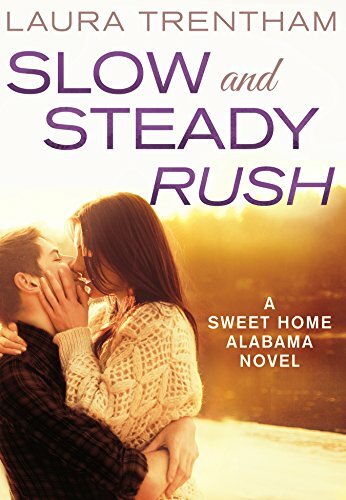 SLOW AND STEADY RUSH takes place in the fictional town of Falcon, Alabama, but Falcon is a mish-mash of actual places in my life. The downtown of my small hometown in Tennessee is the inspiration for Main Street, with the library, the bank, antique stores, and gift stores. But, the Wilde homeplace is based on my mother's hometown in Alabama. The river, the farmhouses, the bottoms...I've swum in the river and ridden through the woods on ATVs. Music is a huge inspiration for me when I'm plotting/musing over my books. While I prefer absolute silence while I write, I have a specific soundtrack for each book, so while I'm cooking or driving or cleaning I cue it up and let my mind wander into into the story. For SLOW AND STEADY RUSH, I leaned heavily on country music. Considering its set in rural Alabama and nature plays a huge role, its not surprising I found inspiration in country music. What to know some of the songs that inspired SLOW AND STEADY RUSH? It Goes Like This by Thomas Rhett - The song playing during Robbie and Darcy's "date" at The Tavern. Stay by Georgia-Florida Line - Robbie state of mind at the end of book when he'd afraid he's lost Darcy forever. When She Says Baby - Jason Aldean - I actually listened to this a lot for both Slow and Steady Rush and Caught Up in the Touch. It seems to sum up both Robbie and Logan.